Katherine Bernhardt, installation view, Contemporary Art Museum St. Louis, January 27–April 16, 2017. Photo: David Johnson. 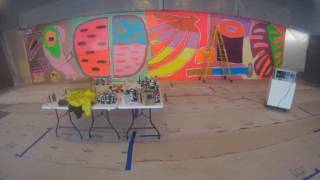 Internationally recognized painter and St. Louis native Katherine Bernhardt returns to her hometown to create a new site-specific mural on the Museum’s 60 foot-long Project Wall. Bernhardt’s signature compositions contain a vibrant color palette and an idiosyncratic personal and political symbology. Her paintings combine such iconography as Windex, Pac-Man heads, and Rubik’s Cubes on single, flat picture planes alongside toucans, toilet paper, and watermelon. At the periphery of her flamboyant use of color and symbols lies a sly exploration of environmental degradation. Colorful depictions of inhabitants of the open sea—hammerhead sharks, sea turtles—swimming amidst Windex and toilet paper are as much commentary on the trashing of the planet as they are oddball cartoons. Bernhardt’s work attracts the eye like painted wallpaper, with rhythmic patterns that mimic those found in Moroccan rugs and African textiles. Her work absorbs Pop Art and Graffiti Art traditions and their preoccupations with commodificationand consumption. Painting with brush or spray can, Bernhardt reinvigorates street-art actions such as “bombing” and “tagging,” collapsing distinctions between the art inside and outside the museum walls. Her mural for the Venus over Manhattan Gallery in Los Angeles, Fruit Salad (2015), is an amalgamation of her recent pictorial vocabulary, her Puerto Rico-inspired colors, her rhythmical patterns and structural rigor. Although the mural has become part of the tapestry of the LA streetscape —random graffiti tags are only an alley away—it is also distinct within the environment, an essay on form amidst everyday chaos. Bernhardt will be in residency at CAM January 5-7, 2017. Katherine Bernhardt (b. 1975, St. Louis; lives and works in Brooklyn, NY) has recently received solo exhibitions at CANADA, New York (2014), Roberto Paradise, San Juan, Puerto Rico (2013), and The Hole, New York (2013. Her work has been exhibited by Salon 94 in New York, Macro Future Museum of Contemporary Art in Rome, Carbon 12 in Dubai, galleria Suzanne Tarasieve in Paris, and many more. Bernhardt received her BFA from the School of the Art Institute of Chicago, and her MFA from the School of Visual Art in New York City.